Scientists who discovered this galaxy cluster in 2012 nicknamed it "El Gordo" because of its gigantic mass. New data from Hubble indicate El Gordo may weigh 43 percent more than the original estimate. El Gordo is the most massive, the hottest, and gives off the most X-rays of any known cluster at its distance or beyond. Like the Bullet Cluster, El Gordo is the site of two galaxy clusters running into each other at several million miles per hour.El Gordo is located over 7 billion light years from Earth, meaning that it is being observed at a young age. 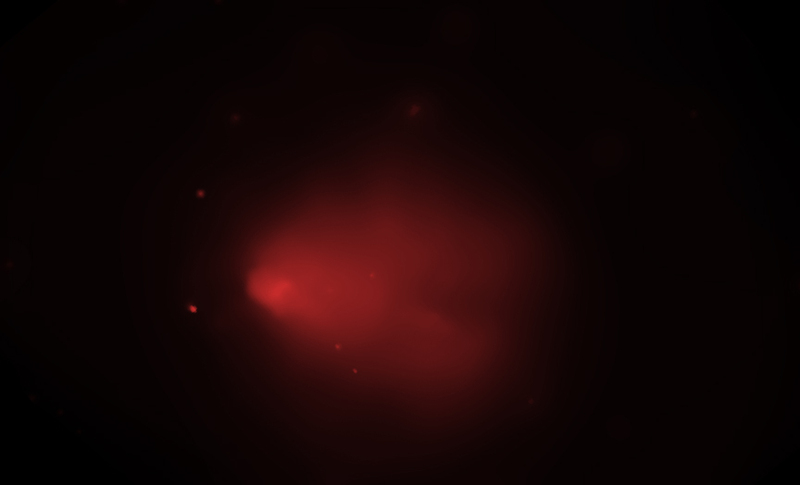 This is a composite image of X-rays from Chandra and optical data from Hubble of the galaxy cluster ACT-CL J0102-4915, located about 7 billion light years from Earth. This cluster has been nicknamed "El Gordo" (or, "the fat one" in Spanish) because of its gigantic mass. Scientists first announced the discovery of El Gordo with Chandra and ground-based optical telescopes in 2012. They determined that El Gordo is the most massive, the hottest, and gives off the most X-rays of any known galaxy cluster at its distance or beyond. New data from the Hubble Space Telescope suggests El Gordo weighs as much as 3 million billion times the mass of our Sun. This is about 43 percent higher than the original estimate based on the X-ray data and dynamical studies. The new Hubble study determined that most of the mass is hidden away as dark matter. The location of the dark matter is mapped out in this composite in blue. Because dark matter doesn't emit any radiation, astronomers instead precisely measure how its gravity warps the images of far background galaxies like a funhouse mirror. This allowed them to come up with a mass estimate for the cluster. 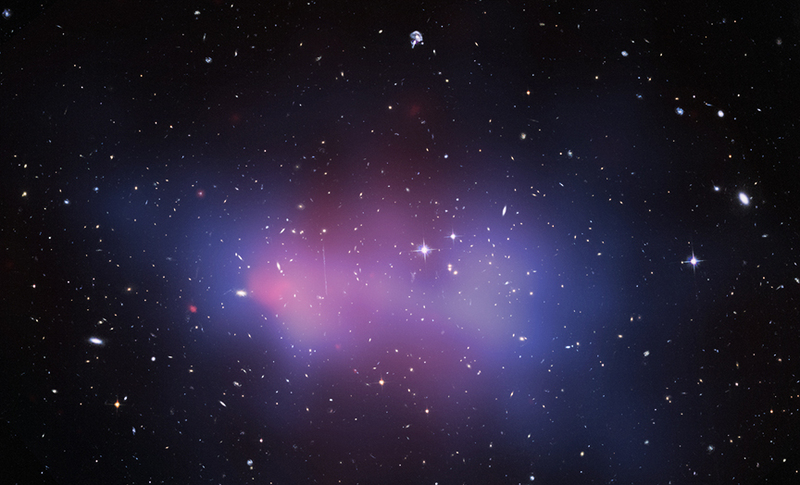 Chandra's X-ray data are shown in pink and these have been overlaid on optical data from Hubble that shows the individual galaxies in the cluster as well as stars in the field of view. The X-ray image of El Gordo reveals a distinct cometary appearance. Along with the optical data, this shows that El Gordo is, in fact, the site of two galaxy clusters running into one another at several million miles per hour. This and other characteristics make El Gordo akin to the well-known object called the Bullet Cluster, which is located almost 4 billion light years closer to Earth. Nice image. I was wondering about the nature of the discrete red blobs that appear from the x-ray image at various points. Above is a galaxy shaped jellyfish, is a clash of stars. El Gordo is a fun name for a cluster. A galaxy cluster ACT-CL J0102-4915, located about 7 billion light years from Earth. About 7.2 billion light years Earth. Combining X-rays from Chandra with optical data from from Hubble. About 7.72 million light years across. X-rays are red, optical red, green and blue and derived mass blue.